Some weeks ago I bought a pair of cheap return flights into Charleroi, a regional airport located roughly seventy kilometres south of Brussels. At the time a number of new coasters were under construction within a few hours drive in all directions, and I figured that I'd come up with an itinerary once it became clear which of them would be ready in time for our trip. Ten days prior to travel there were only two workable choices to plan around; we could either head north to Attractiepark Slagharen, or we could head west to Plopsaland De Panne. The prospect of a new wood coaster at the latter made the decision easy, and we duly filled out our itinerary with a few smaller parks nearby. 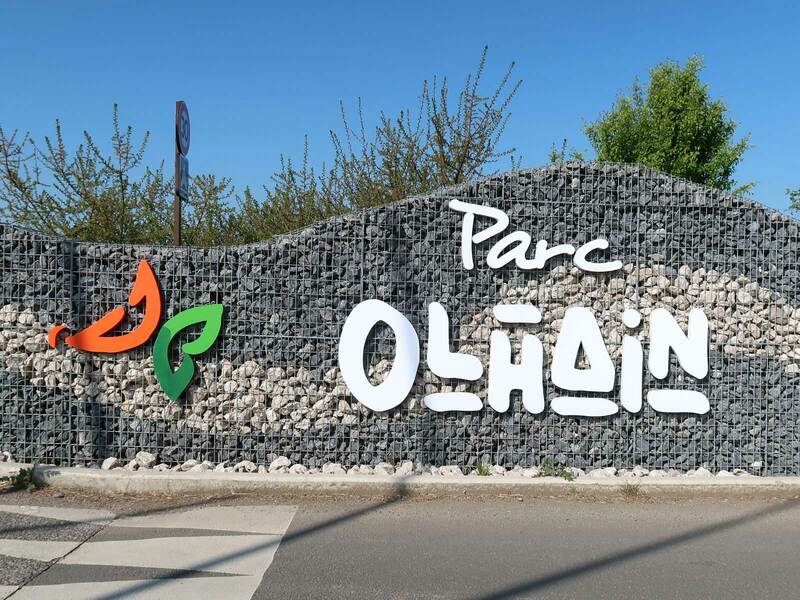 Parc d'Olhain is a two hundred hectare public park located around three quarters of an hour by road from Lille. The grounds feature a variety of different walking trails, as well as mini-golf, tennis courts, a swimming pool, a ropes course, and an alpine coaster. Those visiting only for the latter should be aware that the small car park that can be seen close to the ride on Google Earth is not accessible without a staff pass; for the general public the nearest choice is around a kilometre away on foot, and much of that journey is uphill. It was some twenty minutes after the posted opening time when we arrived at the entrance to the Luge. There were a handful of other guests waiting in front of a rope barrier, including a group of four German speakers that we immediately pegged as coaster enthusiasts. There was something about their appearance that gave the game away even before we saw one taking random pictures with a SLR camera, and our suspicions were confirmed when we saw them again at all but one of our stops over the balance of the weekend. Our arrival seemed to wake up the staff members from their early morning stupor, as moments later one of them emerged from the ticket office and took down the barrier. His glacial pace and the obvious ill-temper on his face made it abundantly clear that he'd yet to have his morning coffee. As the last to arrive we would normally have let the others go to the ticket office first, but as nobody had moved some fifteen seconds later Megan and I decided to lead the way. Our plan had been to ride separately, but my broken French wasn't good enough to convey that message, and thus we ended up with a two person ticket for the very reasonable price of €4. One of the features of more recent Wiegand installations is an automatic safety brake. This system prevents rear end collisions, which is to be commended in a world where riders cannot always follow instructions. Unfortunately it also causes the sleds to slow down on their own ahead of sharper corners, and this feature is decidedly suboptimal for the average enthusiast. There were several points during the Luge where we felt the pull of the brake taking a few kilometres per hour off our top speed, and while the impact on the experience wasn't as severe as it might have been it was nonetheless impossible to miss. Despite this limitation, however, we very much enjoyed the ride. There was nothing hugely memorable about the layout, a comment that can legitimately be made about most (if not all) alpine coasters, but it was negotiated well and the sensation of the cold wind blowing in our faces felt refreshing. We decided that it was worth spending a few minutes on a second lap on the grounds that we don't expect to return in the foreseeable future. 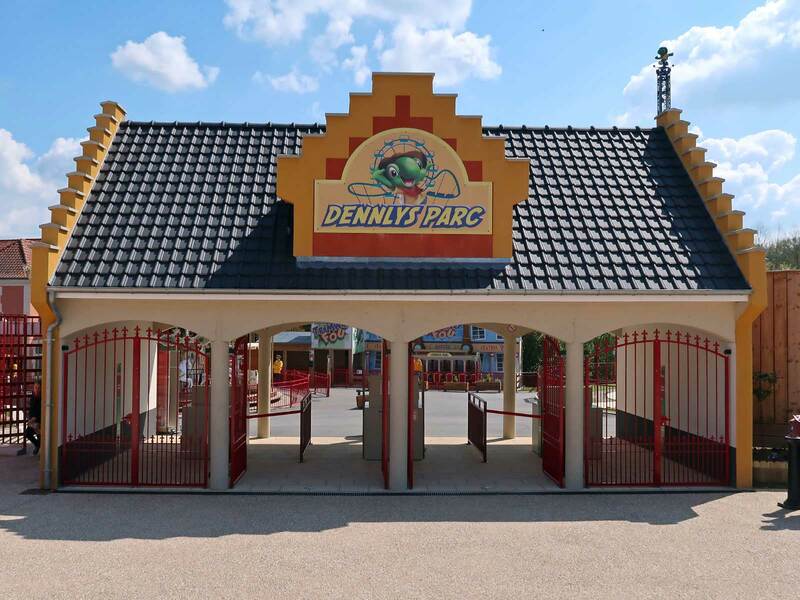 When I first visited Dennlys Parc back in 2006 it was a pleasant family park, albeit one that had a lot in common with a children's playground. The majority of space was devoted to swings, slides, and climbing equipment, and the handful of amusement rides were for the most part targeted at those under the age of six. The only real exception was a mid-sized coaster at the back of the park, a good ride that felt disproportionately large compared to everything around it. There were no stand-out attractions to bring in visitors from outside the immediate locality. The owners have invested considerably over the intervening years, and the result is a park that has changed beyond all recognition. By the time of my 2010 visit there were fifteen rides including four aimed at thrill seekers, but there was plenty more to come. This year the park features thirty-one rides on its roster, including four enfants, twenty-one en familie, and six sensations, including the only tower ride within a one hundred mile radius. We decided to start our visit with Nitro, now one of three steel möbius coasters from Italian firm Preston & Barbieri. Today there was a definite sense that the build quality of the hardware wasn't quite up to the standard set by the more mainstream ride manufacturers. First, we noted that all empty seats were being loaded with ballast, suggesting rather strongly that a minimum weight is required for the individual cars to complete the course. Second, the shared lap bar in our car locked diagonally, pinning me into my seat tight enough to restrict breathing while leaving a ridiculous amount of space for Megan. Despite the somewhat inauspicious start however the ride was reasonable enough. There were a few rough moments in the turns, but the overall standard was markedly better than Max Adventures Master Thai (though to be fair that's not saying a whole lot). Our next stop was at the Montgolfières wheel, both as a location to photograph from and as a conveniently tall structure from which to spot the new coaster. It was surprisingly difficult to locate Voltigo (#2326) from the heights, as numerous sets of trees stood in the way, but we eventually caught a glimpse of its pink track through the trees. A figure eight spinning coaster was never going to be a top ten ride, but this one from Gosetto was fairly decent; though there wasn't a huge amount of spinning the train negotiated the track without any perceptible jarring. The ride footprint was noticeably bigger than the ubiquitous SBF Rides version, making me wonder whether the elongated transitions help with smoothness. 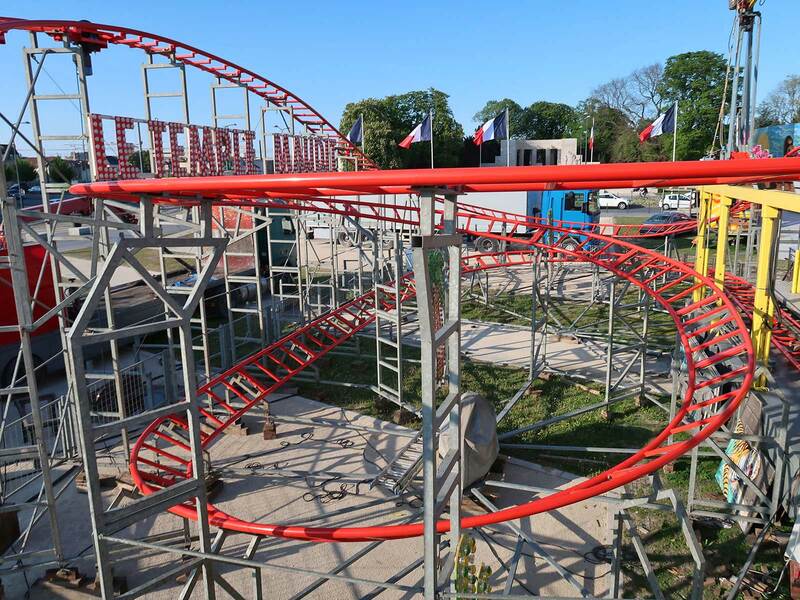 Soquet isn't a particularly well-known manufacturer among enthusiasts, as almost all of their coasters are in France. There are only a handful of exceptions, and most of those were resold by their original owners; as of this writing only two are believed to have started their life abroad. Their relative paucity is, in the view of this writer, an utter travesty, as their custom family coasters are far and away the best rides of their type anywhere in the world. 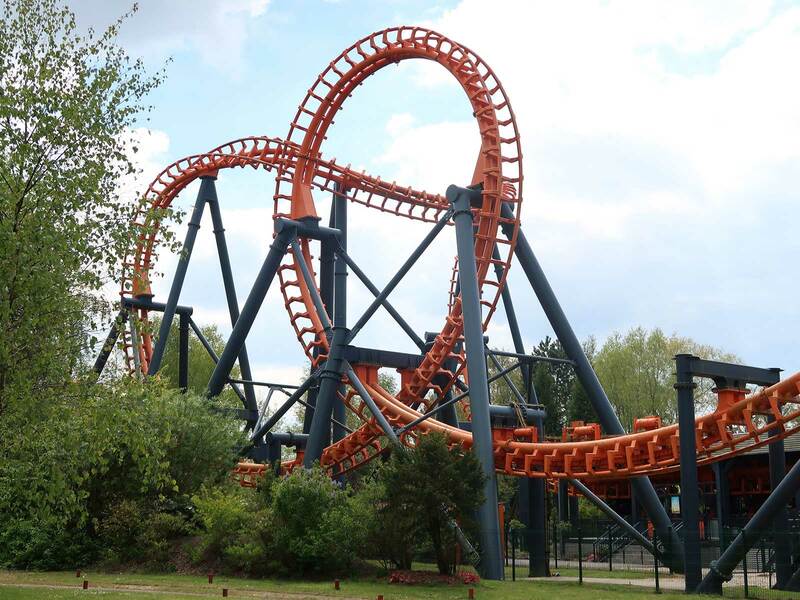 Furio is a typical example, with almost three hundred metres of track that features both respectable airtime and powerful lateral forces, the latter made particularly memorable by a wide train design with no seat divider that allows passengers to slide from side to side. The ride quality was very good indeed considering the age of the hardware, and we ended up riding twice. Megan was insistent that we ride the Tractofolies, a tractor ride through a model farm. I'd been expecting this to be a SBF Rides product complete with a jingle rendition of Under the sea, but the vehicles were quite different. Subsequent research online revealed this to be the first (and thus far only) installation of the Dream Farm product introduced by Gosetto in 2015. The ride squashed a lot of track into a very small area making it look a little crowded, though it seems unlikely that the target demographic would pay much attention to that. We were on our way back to the entrance when our path took us past Vigie, a thirty-seven metre high Flash Tower from Zamperla. Neither of us had come across one of these rides previously, and given that, we decided that we might as well give it a try. In hindsight we should probably have realised that there was something afoot when we were told to empty our pockets in an otherwise laid back park; as it was, each of the three ascents was capped by an enormously powerful airtime moment that threw us into our overhead restraints with gusto. The experience was as surprising as it was brilliant, and though I don't generally rank flat rides I have no qualms in describing this one as one of the best I've experienced in my travels. Eleven years ago my travels brought me to Bagatelle, a large park located about sixty kilometres south of Calais on the north-western coast of France. My trip report from the time reveals little about what I thought of the place, but my photos show a collection of unadorned rides that could have been lifted directly from manufacturer catalogues, unequivocally categorising the place as an amusement park rather than a theme park. Today it was clear that this is in the process of changing, and though there is plenty more to be done the place looks far better than it once did. Our first stop was at Kid'z Coaster (#2328), a standard layout Big Apple installed in a prime position just over one hundred metres from the main entrance. This spot was once the home of the park's spinning coaster, then known as Ragondingue, though that positioning was never optimal as limited space left no room for the queue on busy days. Rather than retire a popular ride, management elected to move it to the far side of the park, retheming it in the process. The coaster now known as Famous Jack was running very well today, with some particularly forceful spinning. It was also good to see a full complement of cars in operation, a definite improvement from years past. With that done we headed over to Triops, the prototype Vekoma Invertigo now operating in its third home. The queue was empty despite a good number of observers in the general area, which was more than a little ominous. I found myself suspecting that this two decade old Vekoma hardware might be something best admired rather than ridden, but throwing caution to the wind I gritted my teeth and took a seat in the middle of the train with Megan seated opposite. 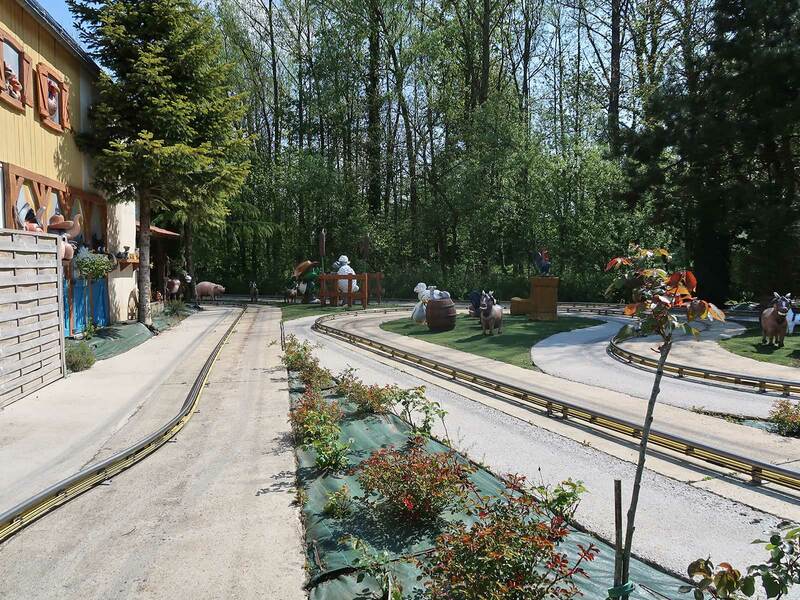 It wasn't until we were about half way around the track when I realised that the experience was actually a good one; as with its twin at Movieland Park the train negotiated the track with minimal jarring, resulting in an unexpectedly good ride. We'd deliberately waited until after the multitudes had finished their lunch before stopping for our own, and found ourselves caught out; at 2:30pm the buffet at La Marotte had already closed for the day, and the Aérogare grill had essentially run out of food, with just three grim-looking polystyrene packages under a heat lamp that had probably been there for hours. My spoken French was insufficient to decode what the staff member tried to say to me, and as a result we ended up aborting entirely in favour of a roadside stop later in the day. I'd have understood better if we were visiting on a weekday out of season, but it was quite an embuggerance to be left with nowhere to eat on a Saturday afternoon. Instead, we decided that our best bet was to finish the coasters then seek food elsewhere. We thus climbed the stairs leading to Gaz Express, previously Bouzouk. In years past this ride was entirely outdoors, but no longer; the track now passes through several buildings and one whole section of track is fully enclosed. These changes constitute a significant upgrade for what was already a top notch coaster, and I'd give the ride full marks were it not for a new addition to the lap bar that is not entirely friendly to adult male riders, especially when the train passes over an airtime hill. It was possible to avoid the worst of the problem by bracing, and I did that for my second lap. Ten minutes later we'd ticked off the family-sized Spirale des Dunes and had begun making our way slowly towards the exit. However, we decided that we couldn't leave without a photo run from Le Monorail, a single station Soquet design with a routing covering a large portion of the park. In times past there were lots of good shots from overhead, though the possibilities have faded in the intervening years as the various trees have gotten taller. There was nothing worthwhile of the coasters, though we managed a couple of nice shots of the River Splatch flume and of Silver Wings, a Zamperla Air Race. It was just after three in the afternoon when we got back to our car. We could have driven to our hotel and its restaurant in about an hour, and sensible people would no doubt have done just that. However, as coaster enthusiasts the prospect of picking up an obscure credit was too much to resist, even if it came at the cost of almost five extra hours in the car. Our target was the Reims Foire du Paques, a month long event that was temporary home to a coaster neither of us had come across before. The drive was straightforward, being motorway for virtually the entire route, and the anticipated parking nightmare failed to materialise as there was a huge metered lot directly across the road from the fairground. At first glance it looked to us like the event only had two rides, namely a knock-off version to the Huss Breakdance and our target coaster: Indiana Jones Le Temple Maudit (#2329), otherwise known as Indiana Jones and the Temple of Doom. We quickly bought tickets and took our seats in the front car. From that location it felt very much like the train had been fitted with hexagonal wheels; the train clattered around the track in a manner very reminiscent of the various family coasters by Wisdom Rides. Despite the general level of awfulness however the ride had both of us laughing ourselves silly, and while we didn't go back for a second go the hilarity cheered both of us up immeasurably. Closer investigation revealed there to be about a dozen smaller rides hidden in a nearby wooded area. These were accompanied by a typical selection of games and sideshows, though a number were closed today and there were a few vacant spots also. It was evident that business had been weak despite a city centre location, encouraging some of the showmen present to go home early; even as we explored we saw a van driving off the site with a trailer containing bungee trampolines.